APTBCN Apartment Super Balmes i Barcelona, Spania: Bestill nå! 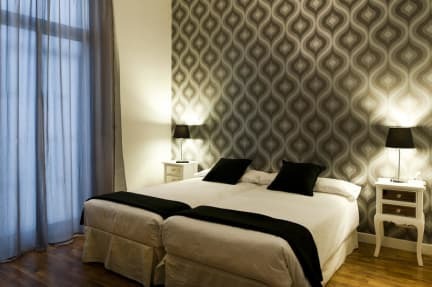 Apt Super Balmes Barcelon has a superb location in the city centre, conveniently close to the major tourist attractions like Plaza de Catalunya and Las Ramblas, the most vibrant and cultural streets in Europe. Other popular areas located nearby include Paseo de Gracia, Borne and Barrio Gotico. The beautiful beach and port are located within 20 minutes walking distance. For the night lovers there are plenty of trendy pubs and clubs to discover. Super Balmes Apt consists of 4 large modern apartments ideal for big groups of 9 to 13 people. All the apartments have been completely refurbished in the last 3 years. All the facilities are of great quality and you just can’t beat the location. Every apartment is 120 m2 (1200 sq.ft.) and include 4 or 5 bedrooms, 2 or 4 bathrooms, a fully equipped kitchen and a living area. The apartments are all equipped with complimentary wireless Internet access. 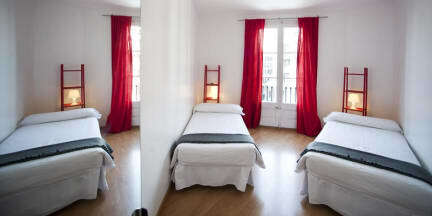 Also in these apartments you can rent a private room and use all the common facilities. This idea gives Barcelona visitors an economic option in accommodation with the opportunity to have kitchen facilities and a great environment to meet people and share information about the city. The kitchens at Apt Super Balmes Barcelona are stylish and fully equipped with all cooking and eating utensils, a refrigerator, microwave-oven, toaster and stove. The bathrooms are specially designed for comfort with two separate showers and two separate toilets. Every bedroom features large glass window doors that open on to balconies. On top of that you will find in every room single beds, closets as well as bed linens and towels. These apartments are not only stunning, inexpensive and well-equipped but the location is absolutely the perfect base to explore this vibrant city.